This counter height dining table and chair set is perfect for the casual dining and entertaining space in your home. 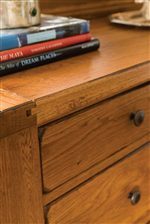 The planked table top has a smooth edge and an authentic rustic feel, with an 18 inch leaf to easily extend the length to 66 inches to accommodate guests. Sleek square tapered legs give the piece a cool contemporary update. The chairs have high curved Windsor backs, featuring round vertical slats, and the chairs have a contoured wooden seat for comfort. Tall round turned legs and stretchers are a nice touch. This charming set will be the perfect gathering place when family and friends arrive. The Attic Heirlooms Counter Height 7 Piece Dining Set by Broyhill Furniture at AHFA in the area. Product availability may vary. Contact us for the most current availability on this product. Top of Dresser with Aged Antique Look.